1 Bridal Bouquet: 5-7 Burgundy Carnations, 3-5 Quicksand Roses, 3-5 White Anemones, 3-5 Dark Burgundy Scabiosa, 2-3 Rubicon Spray Roses, 2-3 Stems Thistle, Sprigs of Sprigs of Seeded Eucalyptus and Nagi. Pinterest Inspo Pic. 4-5 Bridesmaid Bouquets: 3-5 Burgundy Carnations, 2-3 Quicksand Roses, 1-2 White Anemones, 2-3 Dark Burgundy Scabiosa, 1-2 Rubicon Spray Roses, 1-2 Stems Thistle, Sprigs of Sprigs of Seeded Eucalyptus and Nagi. Pinterest Inspo Pic. Bouts or Corsages: Average 1-2 spray rose buds or Thistle buds per bout, and 3 buds per corsage. Add sprigs of your favorite green! 2 Ceremony Urns or Pergola Foam Cages: Green out with 1/2 bunch of salal, seeded euc, and nagi greenery per urn first. Then back-fill with 10-13 Burgundy Carnations, 10-13 Quicksand Roses, 7-10 Burgundy Snapdragons, 5 Rubicon Spray Roses. Pinterest Inspo Pic. 10 Centerpieces, 5'' diameter: Green First with Seeded Eucalyptus and Nagi, 3-5 Burgundy Carnations, 3-5 Quicksand Roses, 1-2 Rubicon Spray Roses, 1-2 Thistle. Pinterest Inspo Pic. 18-20 Mason Jar or 3'' Vase: 2 Quicksand Roses, 2 Burgundy carnations, 1-2 Rubicon Spray Roses, 1 Thistle, sprigs of greens. Here's our Navy and Wine Pinterest Board that inspired this combination of flowers. 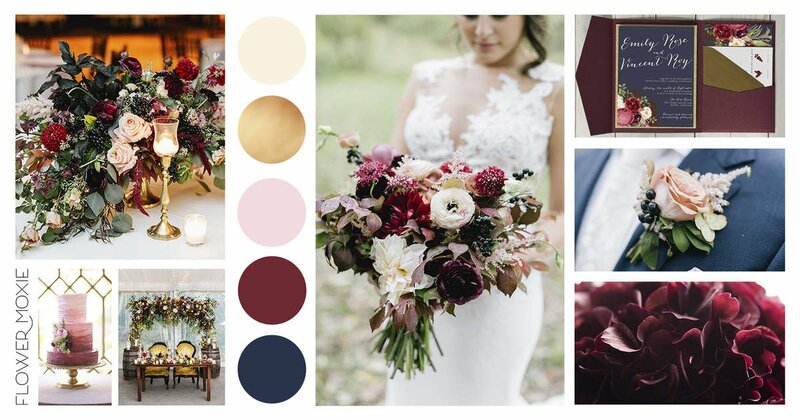 We hand-selected predictable and year-round flowers that will be easy to work with and give you the same or similar vibe that's happening within these mood boards to take the guess-work out of it!